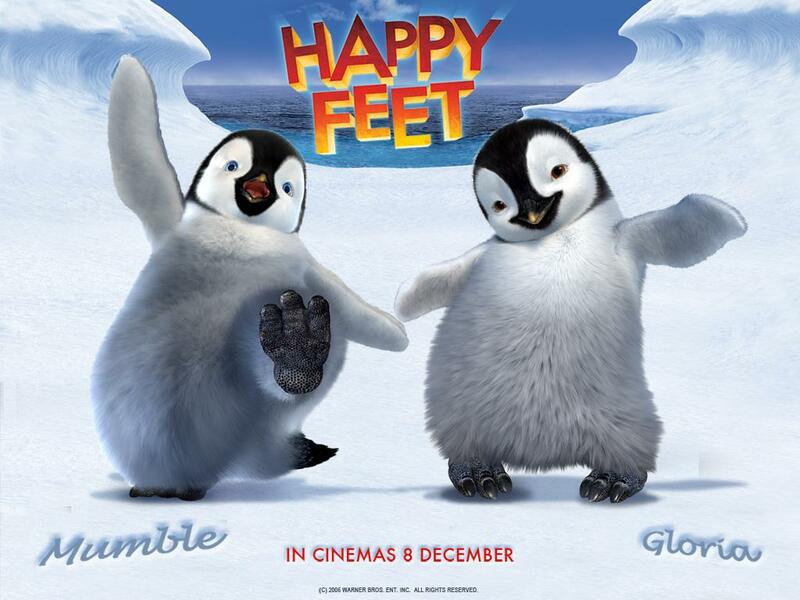 Happy Feet is a 2006 Australian-American computer-animated musical family film, directed, produced and co-written by George Miller. It was produced at Sydney-based visual effects and animation studio Animal Logic for Warner Bros., Village Roadshow Pictures and Kingdom Feature Productions and was released in North American theaters on November 17, 2006. It is the first animated film produced by Kennedy Miller in association with visual effects/design company Animal Logic. Though primarily an animated film, Happy Feet does incorporate motion capture of live action humans in certain scenes. The film was simultaneously released in both conventional theatres and in IMAX 2D format. The studio had hinted that a future IMAX 3D release was a possibility. However, Warner Bros., the film’s production company, was on too tight a budget to release Happy Feet in IMAX digital 3D. A sequel, Happy Feet Two, was released into theatres November 18, 2011 and received mixed reviews. Every emperor penguin sings a unique song called a "heartsong" to attract a mate. If the male penguin's heartsong matches the female's song, the two penguins mate. Norma Jean, a female penguin, falls for Memphis, a male penguin and they become mates. They lay an egg, which is left in Memphis' care, while Norma Jean leaves with the other females to fish. While the males struggle through the harsh winter, Memphis briefly drops the egg. The resulting chick, Mumble, is unable to sing but can tap dance. Nevertheless, he is enamored with Gloria, a female penguin who is regarded as the most talented of her age. One day, Mumble encounters a group of hostile skua, with a leader who is tagged with a yellow band, which he says that it is from an alien abduction. Mumble narrowly escapes the hungry birds by falling into a crevice. Years later, an adult Mumble is ridiculed by the elders. After being isolated during the graduates' song, he is attacked by a leopard seal. After escaping, he befriends a group of Adelie penguins called "the Amigos", who embrace Mumble's dance moves and assimilate him into their group. After seeing a hidden human excavator in an avalanche, they opt to ask Lovelace, a rockhopper penguin, about its origin. Lovelace has the plastic rings of a six pack entangled around his neck, which he claims to have been bestowed upon him by mystic beings. For the emperor penguins, it is mating season and Gloria is the center of attention. Ramon attempts to help Mumble win her affection by singing a Spanish version of "My Way", with Mumble lip syncing, but the plan fails. In desperation, Mumble begins tap dancing in synch with her song. She falls for him and the youthful penguins join in for singing and dancing to "Boogie Wonderland". The elders are appalled by Mumble's conduct, which they see as the reason for their lean fishing season. Memphis begs Mumble to stop dancing, for his own sake, but when Mumble refuses, he is exiled. At the forbidden shore, the group finds a fishing boat. Mumble pursues it solo to the brink of exhaustion. He is eventually washed up on the shore of Australia, where he is rescued and kept at Marine World with Magellanic penguins. After a long and secluded confinement in addition to fruitlessly trying to communicate with the humans, he nearly succumbs to madness. When a girl attempts to interact with Mumble by tapping the glass, he starts dancing, which attracts a large crowd. He is released back into the wild, with a tracking device attached to his back. He returns to his colony and challenges the will of the elders. Memphis reconciles with him, just as a research team arrives, proving the aliens to be true. The whole of the colony, even Noah, engages in dance.